Music plays an important role in culture. It’s everywhere we go—on television and radio, in elevators, in restaurants, in kids movies. Parents and caregivers instinctively use music to calm and soothe their children. Music expresses joy and love, and it encourages social and verbal interactions. Your toddler probably loves dancing and moving to music. Repetitious songs provide repeat exposure to word use and leads to memorization. Silly songs make children laugh and bring them joy. You can sing familiar songs with your little one and clap and tap out rhythms using your hands or rhythm toys. Music toys for two-year-olds enhance the child’s natural learning environment and help develop music appreciation. The Pound and Tap Bench is a creative twist on the classic xylophone. Three vibrant balls fit into three slots above a colorful keyboard ramp. Pound one wooden ball with a hammer and it rolls down the ramp, producing a delightful ringing sound. With this versatile toy, you can also take the bells out and hammer directly on the keys. 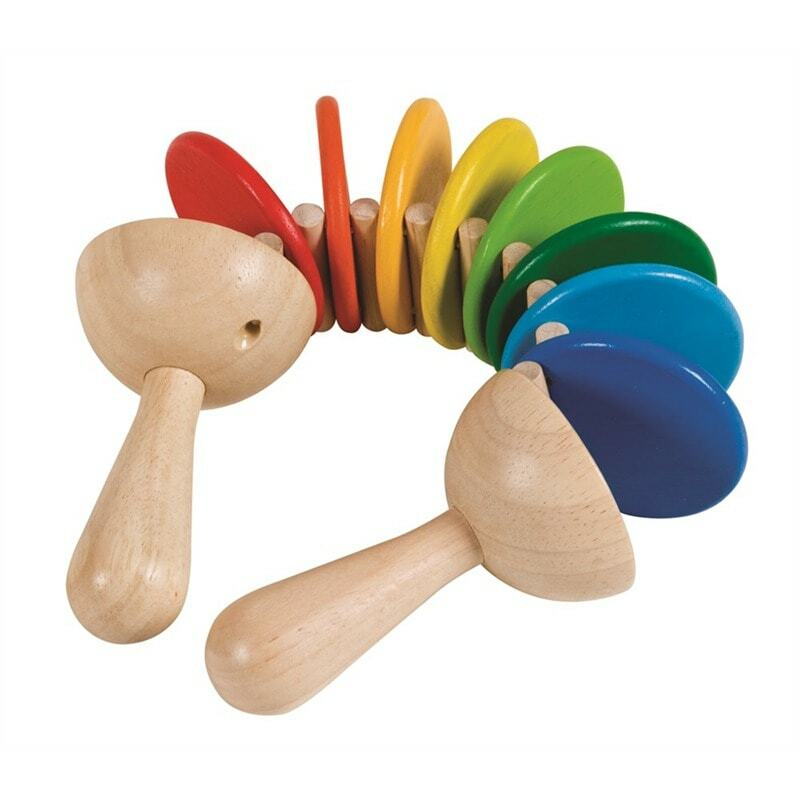 Though natural play interaction with this toy, you can introduce colors, rhythms, and early melodies. Opportunities to learn rhythm, early melodies, and colors. Your little star’s show is about to begin! 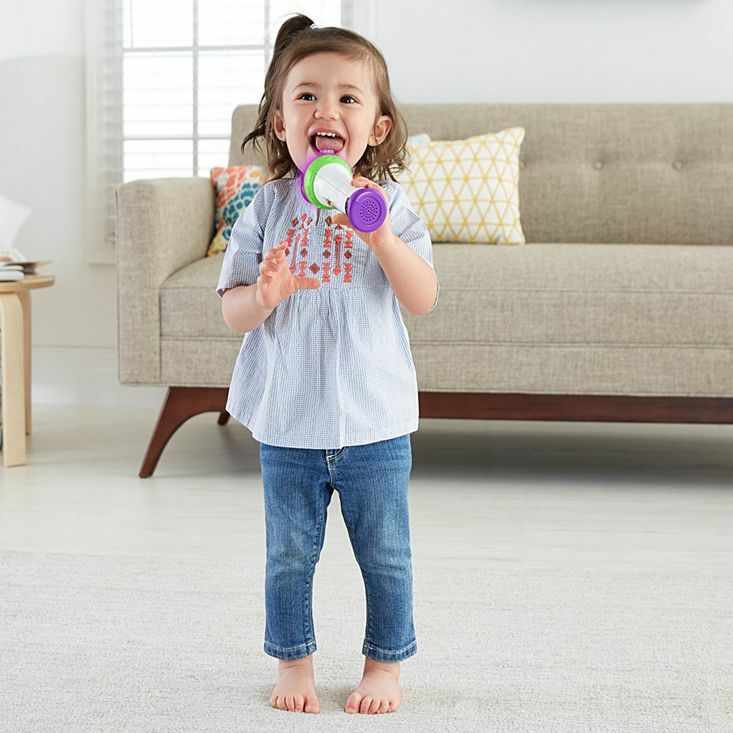 The Laugh and Learn Microphone from Fisher-Price makes a great music toy for 2-year-olds. This music toy provides two modes. Record mode records your voice and plays it back. You can even add fun pitch changing effects and record your own concerts. Sing-along mode provides karaoke and fun learning. As toddlers sing along to these rocking tunes, they also learn the alphabet, counting 1-20, advanced colors, and opposites. The Alilo Smarty Shake and Tell plays over 20 different sounds such as bubbles or a cow mooing.This toy comes preloaded with popular songs and stories for kids, and it’s silicone ears light up in different colors. It also plays classical music and identifies colors. To have the Smarty identify color, simply place it over an object and press down. The ears will lite up with the color and Smarty will say the color. This works best with the 9 included color cards. 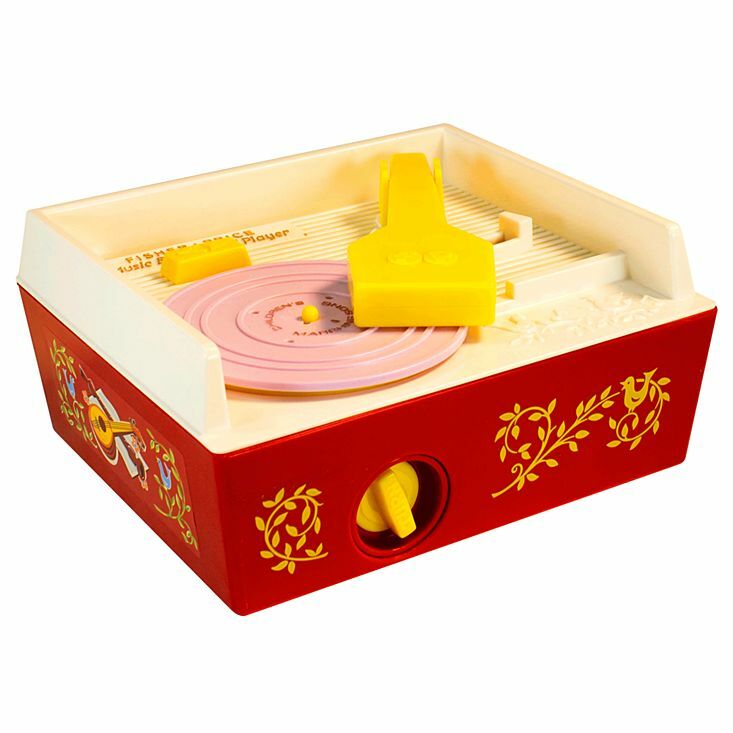 TheClassic Music Box Record Player from fisher-price was first introduced in 1971. This blast from the past is a great music toy for 2-year-olds. This simple design has lasted the test to time. It is very similar to the original version in appearance and play as it has only been updated to match current safety standards Place a record onto the turntable, wind it up, and set the “needle” for a classic tune such as Humpty Dumpty, Jack and Jill, London Bridge, or Camptown Races. Requires 3 AA batteries (not included). 5 double-sided records for 10 songs in total. Encourages fine-motor skills and an interest in music. 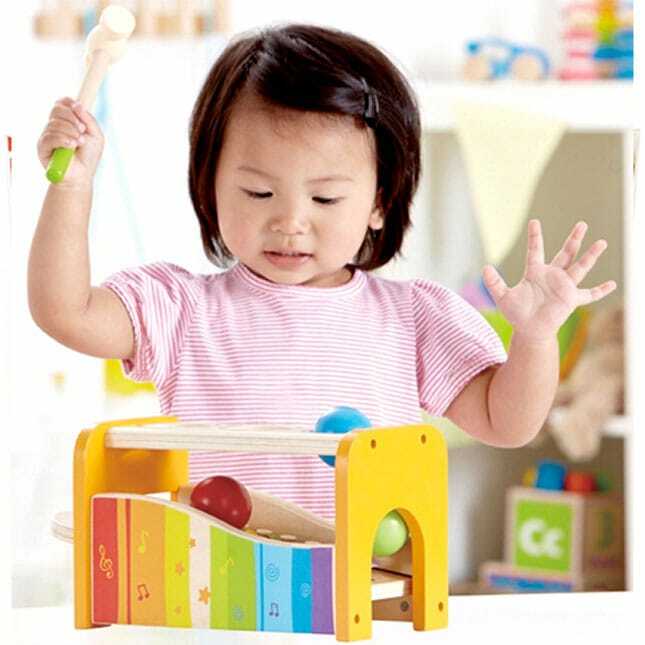 This Clatter from PlanToys is a excellent rhythm instrument for 2-year-olds. The Clatter to produce different click-clack sounds as the child’s hands go up and down. This toy is great for sensory perception skills. The Clatter requires use of both hands to perform different sounds witch encourages bilateral coordination, cognitive development, and cause and effect learning. 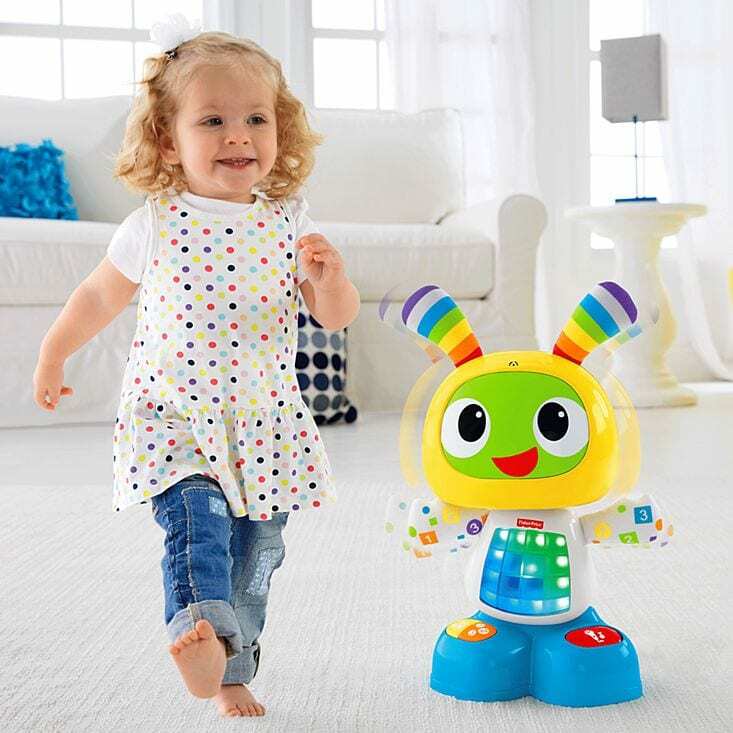 The Bright Beats Dance and Move BeatBo is a fun music toy that encourages your 2-year-old to get up and move. Press the buttons on the LED grid on BeatBo’s tummy or feet for fun songs, learning content, and dance moves. The BeatBo has three grow-with-me modes. In the Dance n’ Move mode BeatBo shakes hips and nods along to lively music while encouraging kids to dance along. The Learning and Games Mode teaches ABCs, colors, and counting. There is also a “Freeze Dance” game. Customized Sing-Along mode let you record your own song or phrase, then BeatBo remixes it into a new song. The Mon Premier Bebe Calin Melody Doll from Corolle is a interactive, musical baby doll. Your little one will love to dance, twirl, and snuggle her beautiful baby doll. This 12 inch doll is the prefect size for toddlers to hug and carry. She has a detailed vinyl face and floral outfit. The vinyl is lightly scented with vanilla. The baby will close here brown eyes when laid down for a nap. To activate her 4 different melodies, simply press her tummy. Boost your child’s musical journey. Pat Bells Station from Playme offers a simple, fun music-making experience for parents and kids alike. The secure, wooden station holds the bells in place. 5 bells are arranged in a pentatonic scale complete in tonality. Every melody you play is garnered to sound pleasant and harmonious. No discord or jarring sound as your 2-year-old engages with the bell sounds. This makes Pat Bells the perfect introduction to music for early learners.